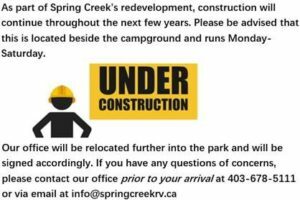 Spring Creek RV offers summer camping from May Long Weekend until the second Monday in October (Canadian Thanksgiving). 15 amp to 50 amp services are available. With over 100 RV Sites, Spring Creek RV is situated in the Heart of Canmore. Wander 10 minutes down the boardwalk to Main Street, where you will discover art galleries, restaurants, shops and more. Explore Banff National Park just 23 kms to the west, or explore Kananaskis just 21 kms to the east. Escape to Jasper National Park. 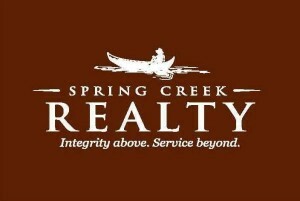 Spring Creek is the gateway to all your adventures! CONSTRUCTION: As part of Spring Creek’s Redevelopment, construction will be ongoing until October 2020. To avoid the construction as much as possible, use the traffic circle entrance. •Good Sam approved •AMA/AAA approved – Ask at time of booking to have discount applied. AIR-BNB NOT PERMITTED. Canmore Float > Will pick you up on site and take you on a relaxing float trip!